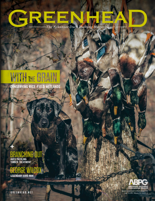 Ducks and geese migrating through Arkansas will find more corn fields to graze than a typical year. With the price for corn on the rise and cotton prices dropping, Arkansas farmers have turned many of their fields to corn in 2010. Arkansas is forecasting to harvest nearly 200,000 acres of corn this year. The 2010 projected harvest is the most recorded since 1998 when Arkansas farmers produced over 240,000 acres. I drove through portions of the Grand Prairie this past weekend and noticed exponentially more corn than I have ever seen in that part of the state. Especially in the area between Scott and Humnoke. Rows and rows of corn where cotton fields used to be. Milo is also on the increase which is another food source puddle ducks like. This area isn't a hotbed for waterfowl, but their habits may shift slightly with the abundance of food available where there was previously nothing. Of course this is only a small area as compared to statewide but I would imagine more and more farmers have gone this route. With more farmland converted to duck food in 2010, this season will be interesting to monitor if the ducks spread out and take advantage of all that is availble to them.